You’ve had lung cancer surgery, and you’re well on the road to recovery. You’ve overcome a huge obstacle, which is certainly a reason to celebrate! But now what? All efforts up to this point have focused on figuring out if surgery was an option, scheduling surgery, and recuperating from the operation. If you still have some questions about long-term impact on breathing, activity, or comfort levels, there’s plenty of information available to help you. But once you are back to feeling pretty good, it’s important to think about what it will take to complete your treatment and stay cancer-free. Will additional treatment be needed? What is the role of surveillance imaging? Additional treatment: When is it needed? Three types of therapy are generally used to treat lung cancer: surgical removal; systemic medications (such as chemotherapy, immunotherapy, or targeted therapy); and radiation beams. In general, for patients with early stage disease, surgery alone offers the best chance for cure. However, even after you’ve had surgery, there may be reasons to receive additional forms of treatment. In general, your surgeon will be able to help you determine if you need to see a radiation oncologist or medical oncologist based on the final pathology report. This report explains what your tumor and the associated lymph nodes looked like under a microscope. In general, if you meet the criteria for chemotherapy and you have tumor markers that would suggest a certain targeted therapy might be useful based on the genetic features of your tumor, you may be offered a targeted therapy. You also may be offered immunotherapy based on the immune profiling of your tumor. There may be other circumstances in which you’re offered additional therapy after surgery as part of a clinical trial. Ultimately, these are caveats to discuss with a medical oncologist. Because the issues that determine whether you need additional therapy are revealed with the pathology report, it’s a good idea to ask your surgeon about the possible need for chemotherapy or radiation at the time her or she gives you the pathology results. This may be while you are still in the hospital, over the phone, or at your first postoperative visit. Ideally, if you need to see a medical or radiation oncologist, it could be coordinated with your postoperative visit to your surgeon. Surveillance imaging: When and why? At your first surgeon visit after your operation, you’ll likely have a plain chest x-ray, with the primary goal of making sure you are recovering well and healing appropriately. After that, you will be scheduled for routine visits to see your surgeon and for cross-sectional imaging (CT scans or PET scans). These regular visits are to review the imaging and how you are doing in order to make sure that you don’t have any signs of recurrent disease or any evidence of a new malignancy. Even after having a curative operation for lung cancer, unfortunately, some individuals can have disease come back. In addition, having been through one experience with lung cancer does put you at risk for developing another lung cancer. For these reasons, detailed scans will be obtained to look for any abnormalities. It’s very important that you stick to the imaging schedule and attend your appointments. If something abnormal is found, the best chances of successfully dealing with new findings are when the tumors are small and easier to rid from your body. 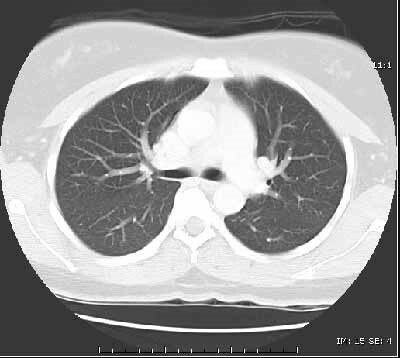 In general, most lung cancer patients are followed with CT scans, which can detect any abnormal growths in the lungs or enlarged lymph nodes in the chest. There are some circumstances—such as an abnormality on a CT scan or a more aggressive tumor that is at greater risk of recurring—in which your surgeon may want a PET scan. The type of imaging as well as the exact timing can vary, based on your surgeon’s practice and your exact case. Most surveillance takes place every 3-6 months for the first 1-2 years, followed by every 6-12 months thereafter. Ongoing imaging annually through the 5th year is recommended. Continued surveillance after 5 years is encouraged. While the exact timing of these tests may vary, it’s incredibly important to follow through with them. If something new pops up, your treatment team will do everything possible to deal with it right away. The earlier the problem is discovered, the easier and more successful cure is likely to be. Congratulations on making it through a major milestone, and best of luck with your continued journey of survivorship. For more information, visit the LUNG CANCER page.